The E. J. LAWAY, JR was built in Cheboygan, MI in 1914 by Captain Edward J. LaWay and named for his young son, Edward J. LaWay, Jr. Her dimensions were: length, 73.1 feet; beam, 20.7 feet; hull depth, 6.0 feet; and gross tonnage, 70 tons. 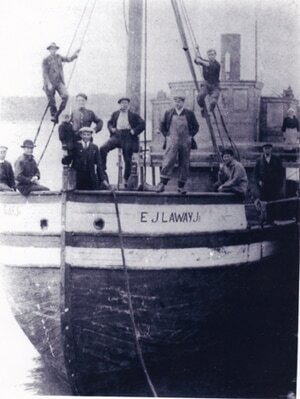 The “EJ,” as the LaWay family called her was employed in the transport of any and all types of bulk or package cargo around the upper Great Lakes. The vessel remained in service until April 19, 1929 when her hull was cut by ice near Chippewa Point on Drummond Island and sank in 50 feet of water. Captain LaWay, an accomplished hard hat diver, returned to the wreck site in 1937 in hopes of raising the vessel and putting her back into service, but found that the hull damage was far beyond repair. As a result he conducted little more than a minor salvage of equipment and left the wreck in place. The E. J. LAWAY, JR. left Cheboygan, MI on the morning of April 17, 1929 on a mission to deliver coal to a fishing camp on Burnt Island (a small island in the North Channel, north of Drummond Island). The first order of business was to pick up the load of coal at the Lime Island coal dock, in the lower St. Marys River. The LaWay then proceeded toward Burnt Island, moving very slowly through water that was filled with floating ice. At around 6 o’clock AM on April 19th, the vessel finally found a stretch of open water near Chippewa Point (at the upper northwest end of Drummond Island) and the crew began to increase their speed. At this point they noticed that the hull had been punctured by ice and the vessel was rapidly taking on water. According to a contemporary newspaper article, Captain LaWay had theorized that while the vessel was moving very slowly through the water, slush had frozen around the breach in the hull, effectively functioning as a “temporary plug,” but as the vessel’s speed increased this “plug” gave way and allowed water into the hull. In attempt to save the ship, Captain LaWay steered for the nearest small island, hoping to run her aground in shallow water. Unfortunately, the E. J. LAWAY, JR. began to sink before they could reach the island and the crew was forced to abandon the vessel. There was no loss of life, but the LaWay family lost their primary means of livelihood only a few months before the Great Depression of 1929. Wreck Description: The wreck lies in 50 of water listing slightly to the left with the stern being higher than the bow. The bow section of the vessel has collapsed and splayed open, but from the cargo hatch, rearward the hull is largely intact. The pilot house and rear upper decks and cabins have fallen forward and to the left. Most of the upper decks, cabins and their contents lie in a large debris field on the bottom to the left of the hull. Some of it lies on the main deck forward and to the left of the boiler. What was once a raised foredeck lies at the bow slightly to the left of the main deck and on it is mounted a very impressive steam windlass. Rearward of the cargo hatch lies the ship’s wheel which is mounted on a large steam driven steering mechanism. Further aft, the boiler and the steam engine can be found still in their original positions. Near the engine are a set of engine gauges and a steam condenser. The rudder and propeller are still in their normal place at the stern, below the transom section. The left side of the deck and the large debris field on the lake bottom to the left of the hull is littered with all sorts of artifacts. Among the more prominent artifacts are a large galley stove, an oak icebox and numerous cooking and eating utensils. The cargo of coal is strewn all over the wreck site and even a good distance aft of the vessel, indicating that coal was probably spilling from the hull as the E. J. LAWAY, Jr. was in the process of sinking. 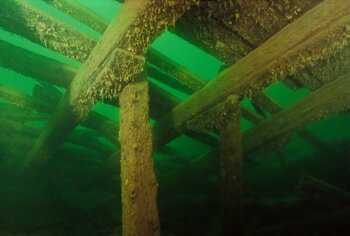 This is a superbly impressive wreck site that serious divers of all levels of experience will not want to miss. It is incredibly rare to find such an intact wreck with so many artifacts interesting artifacts still present. 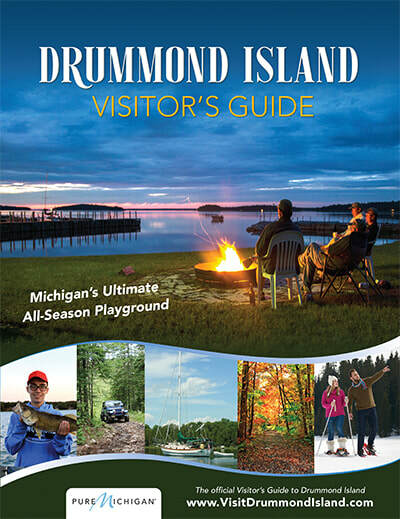 The wreck lies in 50 feet of water on the westerly side of the channel between Drummond Island’s Chippewa Point and Milford Island and immediately south of the Canadian border.